Mathias Beer's article Die Entwicklung der Gaswagen beim Mord an den Juden (1987) is a pioneering work on the subject. There are more recent treatments such as in Andrej Angrick's Besatzungspolitik und Massenmord (2003). But despite the fact that it is the standard work on Einsatzgruppe D, Mattogno has never heard of the study in his screed on the Einsatzgruppen. Beer's figure of six small gas vans dispatched in late 1941 is broken down by Mattogno as "one to Einsatzgruppe C, one to Einsatzgruppe D, two to Chełmno; as regards the remaining two, it is not known to whom they were assigned" (Mattogno, The Einsatzgruppen, p. 309). 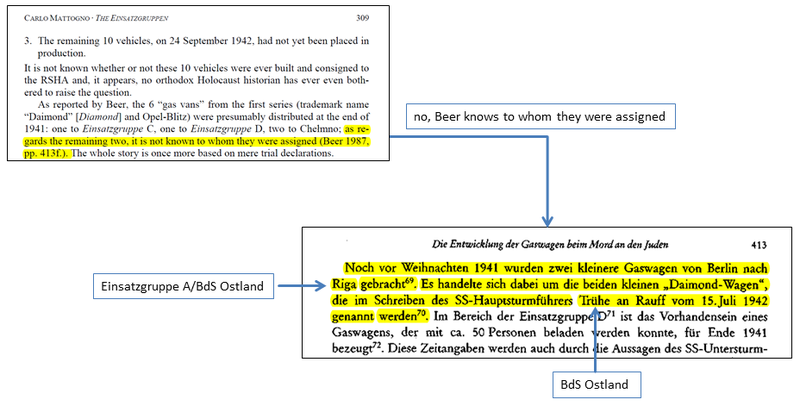 However, on the same page cited by Mattogno, Beer explains that these "were brought from Berlin to Riga" in December 1941 and were later mentioned in a "writing by the SS-Hauptsturmführer Trühe [BdS Ostland] to Walther Rauff of 15 July [correct: June] 1942", i.e. they had been assigned to Einsatzgruppe A/BdS Ostland (Figure 1). "1 Saurer vehicle assigned to Einsatzgruppe B" from Belgrad according to the telex Schäfer to Pradel of 9 June 1942 (PS-501). The sum of this is six gas vans – all to Einsatzgruppe B according to Mattogno's best knowledge (well, that means little as we already know). The Activity and Situation Report of Einsatzgruppe B of 1 March 1942 does not only mention the two Saurer gas vans, but in addition also two "smaller gas vans", which Mattogno omits. 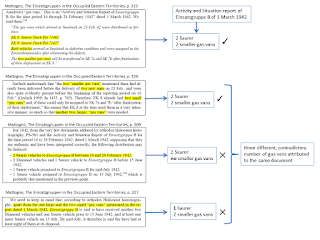 He reproduces the text of the document including the sentence on "both smaller gas vans" (p.323), he also quotes the German historian Christian Gerlach that "the two 'smaller gas vans' mentioned there had already been delivered before the delivery of two new ones on 23 Feb". Mattogno himself argues with these figures that "EK 8 already had two small 'gas vans' and…this means that EK 8 at the time used them in a very intensive manner, so much so that another two, larger, 'gas vans' were needed" (p.326). So what happened to them in his sum? To complete the picture of confusion, he offers yet another variant on p.327, where one reads about "the one large and the two small 'gas vans' mentioned in the report dated 1 March 1942, Einsatzgruppe B". In the Italian edition of the book, it reads correctly "due 'Gaswagen' grandi" (p. 317); this may be either a mistake by the translator or one in an earlier manuscript. 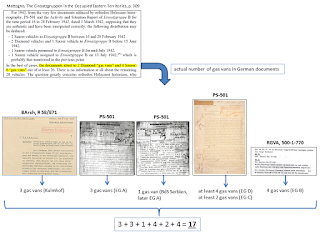 So depending which page of the same chapter one opens, one gets three contradictory numbers of gas vans (2, 3 or 4) taken from one and the same document (Figure 2). 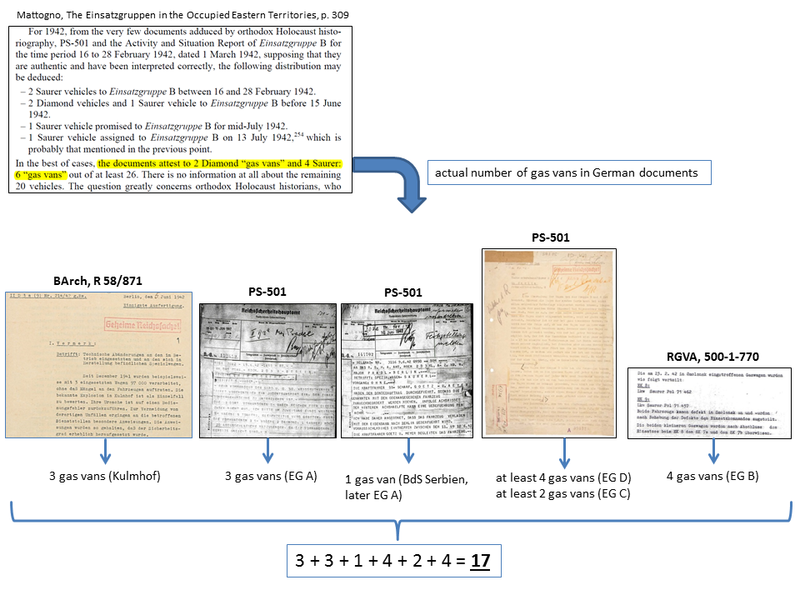 The next in the row are the three gas vans mentioned in a telex by Trühe to Rauff of 15 June 1942. While Mattogno seems to have mastered the challenge to count from 1 to 3 and got the number right, he is wrong that the gas vans were assigned to "Einsatzgruppe B". 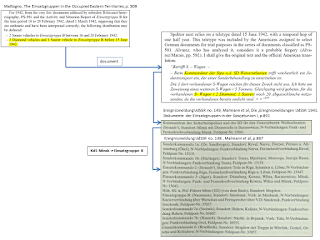 The document states the vehicles were stationed at the "Kommandeur der Sipo u. d. SD Weissruthenien", i.e. the Security Police and Service in Minsk. Einsatzgruppe B was displaced from Minsk in 1941 and the area was taken over by units of Einsatzgruppe A, which formed the basis of KdS Minsk. Hence, the three gas vans were not assigned to Einsatzgruppe B, but to the KdS Minsk/BdS Ostland. 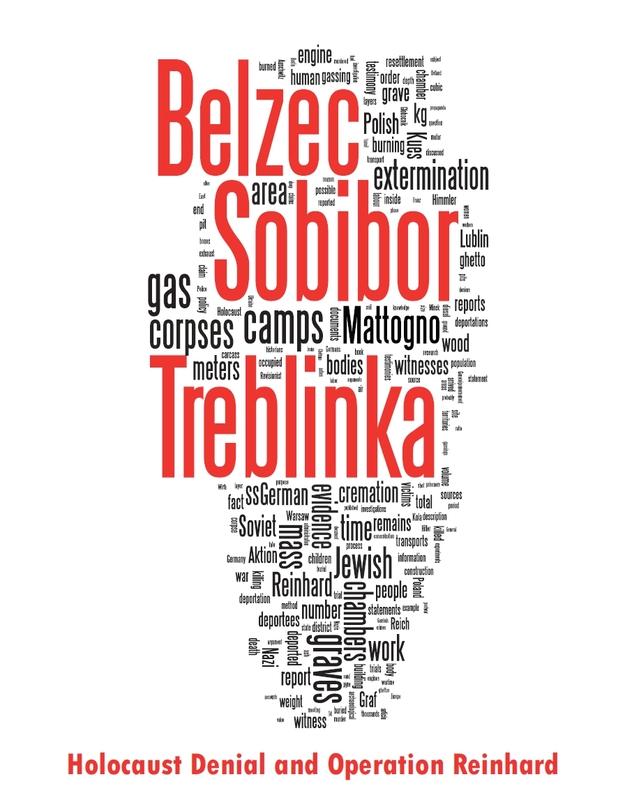 The Ereignismeldung of 25 October 1941 states that the last men of Einsatzkommando 8 of Einsatzgruppe B left Minsk until 3 October 1941. In the following weeks, Einsatzkommando 3 of Einsatzgruppe A was stationed in the town according to the reports. According to Ereignismeldung UdSSR no. 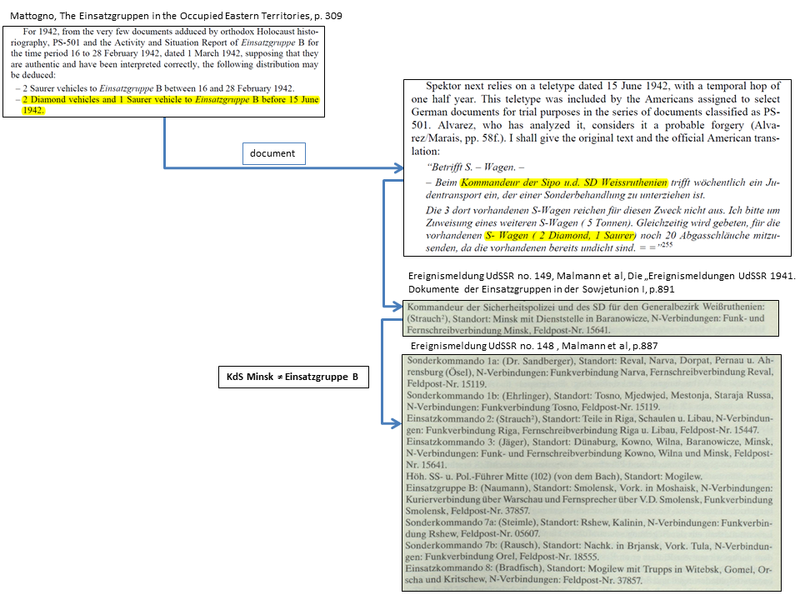 149 of 22 December 1941, the head of Einsatzkommando 2 of Einsatzgruppe A was appointed as "Kommandeur der Sicherheitspolizei und des SD für den Generalbezirk Weißruthenien" in Minsk (Figure 3). The organisation of the Security Police and Security Service in Minsk is also described in standard works, such as Wilhelm, Die Einsatzgruppe A der Sicherheitspolizei und des SD 1941/42, p.308 and Gerlach, Kalkulierte Morde, p.186 – the latter study is cited by him. Mattogno has written a full book on the activities of the Security Police and Security Service in the East - but knows less about it on such basic thing than anybody browsing Wikipedia. His final figure is one Saurer gas van sent to Riga from Belgrad for service in Minsk in July 1942. As above, he is wrong to state that the vehicle was "assigned to Einsatzgruppe B" since it was likewise to be operated by the BdS Ostland/KdS Minsk. Mattogno's next gross mistake is that he has only considered the gas vans in the telexes of PS-501, but not those in the letter Becker to Rauff of 16 May 1942, which is part of this evidence. The letter mentions "vans of Groups D and C", i.e. there had been at least one gas van at each Einsatzgruppe C and D. Furthermore, it reports that "I ordered the vans of group D to be camouflaged as house trailers by putting one set of window shutters on each side of the small vans and two on each side of the large vans". The plural in "vans" suggests that there were at least two small and two large gas vans at Einsatzgruppe D. The document also states that "6 flanges were sent to SS-Untersturmführer Ernst for the vans of Group C to Kiev", i.e. there were at least two Saurer gas vans at Einsatzgruppe C.
Last but not least, Mattogno has omitted the memo by Willy Just of 5 June 1942 in BArch R 58/871, which mentions three gas vans in Kulmhof extermination camp (even if Mattogno may not see it as reference to Kulmhof, though this is clear from the evidence, he should have counted those since he claims to have presumed "the best of cases"). If we correct Mattogno's mistakes and omissions, then - instead of his mere 6 gas vans (on p.327, Mattogno is even aware of how to count eight gas vans from the EG B report and the telexes in PS-501, and has still ignored this in his "best case" arithmetic on p.309, see Figure 4) - contemporary German documents mention at least 17 such killing vehicles operated by the Security Police and Security Service. 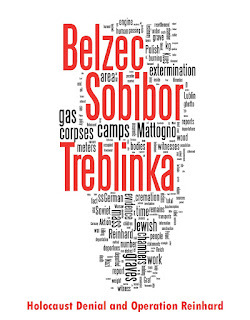 Four to Einsatzgruppe A/BdS Ostland (thereof one from BdS Serbien), four to Einsatzgruppe B, at least two to Einsatzgruppe C/BdS Ukraine, at least four to Einsatzgruppe D and three to Kulmhof extermination camp (Figure 4). Given that Einsatzgruppen A, B, D each received at least four gas vans, it stands to reason that Einsatzgruppe C got a similar contingent (indeed, it is known from the testimony of the gas van driver Findeisen that Einsatzgruppe C received at least one small gas van), yielding about 18 - 19 gas vans dispatched to the East and the Warthegau. 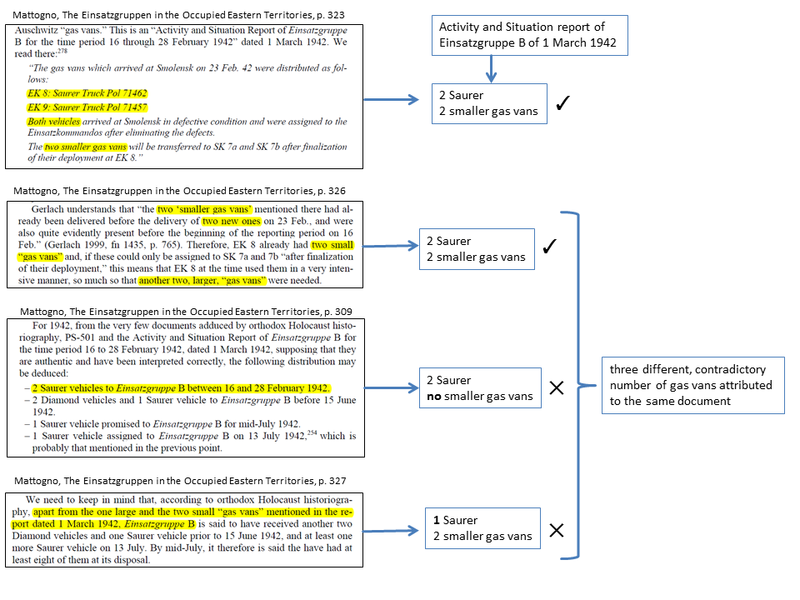 This figure is close to the 20 gas vans fabricated before 23 June 1942 according to RSHA correspondence (presuming that the smaller gas vans are included in this order). 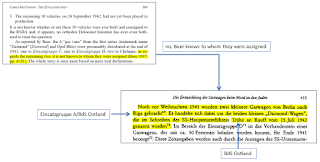 12/2/2019: linguistic corrections, added comment in brackets "(on p.327...etc."